Protomyxzoa Rheumatica is a newly-discovered infectious organism that causes chronic disease. Protomyxzoa was discovered by Fry Laboratories of Scottsdale AZ. Although they have published no scientific papers on the organism, they offer a polymerase chain reaction (PCR) DNA test for the organism, and they have done substantial work on culturing, characterizing and sequencing the DNA of the organism. Unfortunately, all this work remains unpublished. Fry Labs says that protomyxzoa is in the “malaria family” of protozoans, along with babesia and malaria, based on DNA sequencing of the 18s ribosome subunit. Protomyxzoa, babesia and malaria have a multi-stage life cycle. Like malaria and babesia, protomyxzoa appears to have an immature form that infects red blood cells (erythrocytes), and a mature form that remains in the blood. It does not appear to invade other tissues. Mature protomyxzoa surrounds itself with thick, copious biolfilm substances to protect itself from the host immune system. It is believed that this biofilm contributes to various symptoms depending on its location and quantity. Protomyxzoa will cause capillary inflammation and reduced blood flow in locations where it accumulates. It is also believed that the biofilm can harbor secondary infections (e.g. 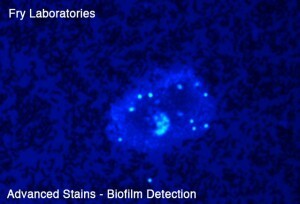 other bacteria) which can cause further variations in symptoms and test results. I was diagnosed in February 2012 by the Fry labs PCR test, after years of persistent symptoms suggestive of a chronic infection. I was initially quite skeptical of the claims by Fry labs of this new organism. I was eventually convinced of the reality of protomyxzoa by 1) negative test results for many other possible infections (e.g. chagas disease, mycoplasma, toxoplasmosis, E Hystolytica etc), and 2) positive responses to drugs generally effective only against protozoans (e.g. ivermectin, artemisinin, miltefosine). Antibacterial or antifungal drugs were not effective. Together these facts suggested I was infected with an unusual protozoan. This website was created because there is so little information available on protomyxzoa. There are no published scientific papers. There is only one published interview with Dr Fry, the discoverer of protomyxoza. There havebeen no published articles in the media. This website was created to provide information for those infected, and improve understanding of this organism. If you have information to share about protomyxzoa (such as scientific papers or personal experiences), please send it and we will make it available on the website. See in particular the “Science Refs” page for information on treatment and antibiotic choices. Below is an interview with Dr Stephen Fry of Fry Labs. This interview is the only known published article on protomyxzoa. I have been very I’ll since being diagnosed with Rheumatoid Arthritis in 09 and Lupus in 2011. In September of 2012 without any improvement with immune suppressing medications I decided to go to integrative medicine and found out I had Protomyxoa RHEUMATICA. I have been in treatment for 4 months although feeling better still have a loooong way to go to becoming the person I was before my onset of illness. As a board member of the Kentuckiana Lyme Support Group, you should know that Lyme Disease has been proven with peer review studies to “mimic” Rheumatoid Arthritis and Lupus, both. Please make sure you see a Lyme Literate doctor. They can treat you for this other infection as well. WE are on Facebook if you need help finding one and you will get better! i am in kentucky could you please direct me to the nearest llmd who also knows about Protomyxzoa? I have been in unusual pain for a year. I was diagnosed with mycoplasma even tho the test results came back negative. I was told there are 4 strains of mycoplasma but only one blood test has been developed to identify one of them. Although I test negative, my doctor believes, according to my symptoms that I do have it. I have been on doxycycline since Sept 2012. I have made great improvements but continue to be in great pain and cannot seem to get off my pain meds of meloxicam. I have been diagnosed with protomyxzoa in Feb and have been on stromectin and have made great improvements but still have great pain. I am a personal trainer at Gold’s gym so this really affects my life style. But by the grace of God He has helped me persevere. I am traveling 150 miles (one way) today to see the doctor that originally diagnosed me with the protomyxzoa. I have told everyone I know that has mysterious pain or a label slapped on their pain, like lupus, MS, about this parasite. TAKE CHARGE OF YOUR HEALTH, ASK QUESTIONS, RESEARCH AND MAKE INFORMED DECISIONS!! I have been on my new meds for a week and feel so much better. If you are not certain your doctor knows how to diagnosis, this find another. Be your own advocate. My original LLMD thought I had Babesia, but after 18 months of intense antibiotic and others meds treatment for Babs, as well as Lyme, i was no better. I have been diagnoses with Protomyxzoa by a new LLMD who does muscle testing. Also, I use a Doug Coil Rife machine and found that this will kill the Proto as I can get a good herx from treatment. It will take some time but already can feel a difference. I use frequency 515 and 1583. Also, by using this machine and not antibiotics, I am not encysting the Lyme while I kill the Proto. Thats quackery. Its absurd to think this rife machine thingie will cure anything. And “muscle testing” is a scam. neither have ever been demonstrated effective by scientific methods. You are going to waste your money, health and time with this nonsense, and thats a tragedy. Take it over to the forum, folks. You can start new threads there. I was diagnosed with PR in September 2012 and have been steadily getting better. It took a little while to really get up and running on the meds but once I did my health has improved greatly. I take 250mg azithromycin twice a day and one Malarone (ant-malaria med.) tablet a day. My symptoms started in 2005 and were really going bad by 2008. I saw countless Doctors, a Physical Therapist and had blood and many other tests and no one could figure out what was wrong with me. Finally a Podiatrist thought maybe Lyme Disease, but all my tests came back negative. I contacted ILADS for a referral for a Lyme literate Dr. and only ONE Name came back “Dr. Fry” and I am so thankful. Does anyone know why Dr. Fry isn’t publishing any of his work? I spoke with folks at Fry Labs about this specific issue several months ago. I was very skeptical about protomyxzoa initiallyt, because there was precisely zero published science. So my first question to the Fry Labs folks was why they have not published. The answer is twofold: 1) medical politics and 2) patent positioning (presumably for testing technology). In the past, when other researchers have published claims of finding new infectious organisms (especially if patents are involved), they are mercilessly criticized in the medical literature and hounded, really. Every hole or weakness in their published results is trashed and exploited by critics. Responding to this onslaught is necessary, because if criticisms are ignored, its seen as a sign of evasion. And responding takes a lot of time and energy. So Fry Labs has deliberately chosen not to invite this media circus and scientific fight, at least not yet. They are waiting to accumulate enough data (e.g. a full sequencing of the genome) before releasing their discovery. When they release, they dont want to have a fight. They want it to be absolutely no-contest and settled from day 1. Related to this is the issue of professional risk. Fry Labs is essentially making a HUGE scientific claim. Protomyxzoa is an enormous medical discovery. An infectious cause of MS-wow! If they make the claim publicly, with media attention, and they are wrong, it is severely damaging to their careers. This is terribly unfair, but that is the reality of how science operates today. If I were in their position, I would do the same thing. This embargo strategy also plays well for their patent strategy. By keeping close their discovery until its fully fleshed out, they have first scoop on almost everything there is to discover about the organism. In my estimation, their main interest is in owning all the possible methods for detecting the organism. Because it is difficult to detect. And there is big money in detection. The folks I spoke with at Fry were open with me and candid. They answered all my questions and were very helpful and sincere. They expressed compassion and understanding for infected people who want to know more. But they simply are not ready, despite the appearance of certainty. The data they are withholding (some sequencing data, who knows what else) is not necessarily helpful for treatment guidance anyway, since they have not yet performed sensitivity testing (testing the activity of different drugs). However, it is true that by withholding what they have found so far, they are inhibiting other researchers from doing sensitivity testing and delaying progress. But this assumes that the claim will be well-received. Medical politics being what it is, it can be argued this is unlikely. I have been informed that a paper is presently in peer review (and has been for many months) and will be published who knows when. I am sure that their paper is receiving especially critical peer review. One area I have not searched is the patent literature. There must be some published patent applications by now. In the US, patents are published 18 months after filing, unless the inventor swears to not file internationally (then it can be kept secret until issuance). Fry Labs may have done this. I dont know. Thats a really long time to be on azithromycin. When taken for long periods it can cause disturbances in heart function. There is some recent literature on that. Sorry to have offended you Dan. With so little research and info out on Proto, I thought that every possible help would be considered. I had a rife machine before I knew i had Proto so I didn’t waste my money. For those who have done no research and/or have not experienced the help they can offer, one might believe it is quackery. But to those of us with Lyme and many co infections, who have gotten no help after decades on drugs and spending thousands of dollars with main stream medicine’s science, we don’t feel that way. Personal testimonies from these individuals who are getting better would argue that it is quackery. I was very skeptical about muscle testing myself, until 3 stool tests showed i had no intestinal parasites, but muscle testing did. With D.E. treatment I am getting rid of lots of parasites. Also, my original LLMD said i had Babesia, but I did not. Three years later, muscle testing showed it was Proto. While using my rife machine as the only killing protocol for Proto, I am significantly reducing my symptoms. I was hoping this was an open forum where people can respectively post freely, offering their experiences without fear of being condemned or ridiculed for offering personal experiences. I hope this is such a forum. I am not very literate on the computer or on forums, so if I posted my comment in the wrong place, I am sorry. I was given this link about Proto by someone on the Lyme and Rife group and didn’t realize you had other threads. Thought that this was the only page. I’m not offended. Just concerned. If you have some substantive scientific information about the rife machine or muscle testing, or credible, reasonably well-documented case reports of these things working, I would love to see it. . Thank for your thorough answer to my publishing question. Most of what you wrote I suspected. I know there are so many people who could benefit from his knowledge and research and I am just so thankful I was given his name. Yes I have been on the azithromycin awhile but it is working very well and I can only trust and believe Dr. Fry knows what he is doing, but I will mention it at my next appt. I appreciate your knowledge on the subject. What is your background in PR? personally, i have experience 35+ years of doctors treating me with all sorts of meds for a multitude of different symptoms and diagnoses when they had no idea what was wrong. it was lyme all the time, yet none could diagnose it for all those years. when it was diagnosed in 2007, i was given the abx cocktails and many other meds for 18 months. It only made me sicker. modern medicine will not research lyme because they say chronic lyme does not exist. i have it, i know it exists, and they cannot tell me it doesn’t. when one does the research on lyme, it will become clear that there are alternative motives in the scientific community that are discouraging the research on lyme. check out plumb island and lyme. scientific medicine said ‘forever’ ulcers were caused by stress and foods. i had one at 16. they sent me to a psychologist to find out what was wrong with me. one scientist claimed it was a bacteria, h. pylori, that was the cause of ulcers. for decades the scientific community rejected his scientific research. today it is well accepted. for instance, i was given a benzo drug, for the insomnia from lyme, telling me nothing about it dangerous addictive nature, and almost dying from seizures getting off it . it took 18 months to taper down, and after being benzo free since last aug., i still experience seizures, body shaking and jerking, and anxiety. scientific research and the ‘powers that be’ resists acceptance of anything ‘new’ and spend decades coming around to what even one of their own discovers. much depends on how much money is invested in what is being used/sold today, at the expense of the patient. i have chosen not to solely follow a system, such as we have today, that does not work to heal, but to bring money into the coffers of those who choose only to invest in what can make them more money. so, for me, personal experience from others as well as myself, is where i will put my faith. for rife technology, you can google ‘royale rife’, doug mclean and/or doug coil rife machine. i’m not sure about muscles testing as there is a lot of info out there, some good, some ‘out there’. the dr i go to is a md who got tired of the system that wasn’t really truly helping people get well, but just medicated them. he specializes in chronic illness. he discovered, through genetic testing, i have defective methylation genes, interfering with my ability to detox (only 10-15%), very thick blood, a bi product of proto, and others health issues that could be helped by the proper supplementation or compounded meds. so far, everything he has done is helping to change my health for the better. one thing good about these support groups is that by sharing with everyone what you have researched and discovered, you learn beyond what is offered by a doctor’s limited knowledge, such as proto. it is a newly discovered ‘bug’, and according to dr. fry, with no abx or other cure beyond consuming a ‘zero fat’ diet, void of meat, seeds, nuts, dairy, fats, oils, etc. a diet almost impossible to do. by sharing everything we know and try, and reporting the results, there will be a cure for proto. being open to looking at (not necessarily following) everything presented, we will find a way to cure this. Im taking this over to the forum. We are going to move almost all the content thats posted here. Rife machines, you say what scientific prof is there that rife machines work? It seems scientific proof is only as good as the people welling to look at and accept scientific proof as fact. Case in point 911? I tested positive for PR over a year ago. I had been treating Lyme Disease for five years. Within two months of treating PR, I was like a new person. I use stromectol, Low Dose Naltrexone, methyl cycle supplements (based upon my mutations) and the low fat diet. When I stick to the diet I can get by without the stromectol, but it is very hard as the diet is so severe and boring. I sure wish there was a cure!